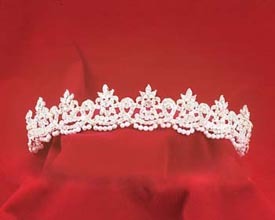 The ornate Duchess Headband Tiara features elaborate scrollwork and pearl accents. Measures 1 1/8" high. Choose a gold or silver metal crown setting.